From Joseph: This is a guest post by Ngina Otiende, a Christian, wife, author and mentor, who blogs at IntentionalToday.com. Learn more about Ngina at the end of the post. There was a fire in his eyes and fierceness in his voice. I had no idea what I was giving up but I just knew something had to change in my marriage. I was a newlywed and young marriage blues had hit our little new love and I felt like I was the only one holding the marriage together. Down the road I see why my pastor was fierce. Quitting is not a neutral action. When you give up hope, you don’t stay at that same spot. You move backward. 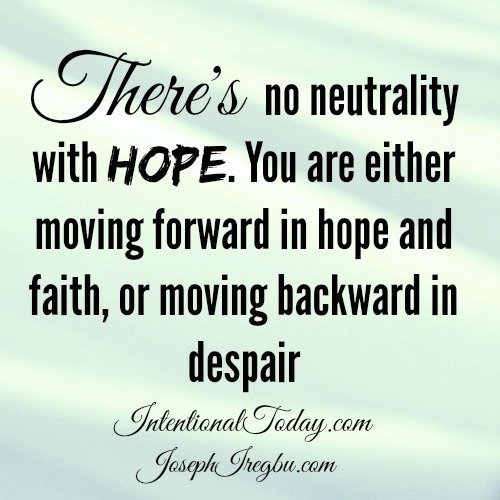 There’s no neutrality with hope, you either have it or don’t have it. You are either moving forward in hope and faith, or moving backward in despair. As a marriage writer and mentor, I hear from wives who want to engage the neutral gear. They have tried changing their man and their marriage and nothing has worked and they slide into next recourse: they quit on hope. Someone has to be rooting for the health of a marriage. As a wife, if you feel your husband is not rooting for the health of your marriage, who else is left but you? You and God are a majority. Consider this; what if God has allowed you to come to the end of your rope and wits, so that you can let go and allow Him to do the work? You see, sometimes we are so deep in our marriage blues we don’t even realize how much we’ve put our faith in other things other than God. Marriage can be complex and its easy to lose sight of where we end and God begins. We read and see all kinds of advice and we rush home to apply them. Without knowing it, we begin to put our hopes in formulas and principles more than God, the Source of all life. Sometimes, we must max out our strength so we can turn to God’s strength. God has deep mysteries to show us about marriage and often we learn them through hard times and trials. The content in this post is adapted from Ngina Otiende’s new book Blues to Bliss: Creating Your Happily-ever-after in the Early Year which is now available on Amazon on both Paperback and Kindle. When you buy Blues to Bliss between 2nd–6th February 2015, you will receive two free gifts (in digital format) as thank you from Ngina. Her brand new 7-day Devotional for Wives — filled with practical tips, questions to ponder and scripture. The Love Check List –– Scriptures on areas of struggle for earlywed wives. To get the Devotional and Love Check List, simply email Ngina Otiende your receipt: blog@intentionaltoday.com and she will send you info on how to access the gifts.